Since 2018 the ScienceCampus Halle has been awarding postgraduate scholarships for "bridging support" to doctoral students of WCH members. Up to three months will be funded with 9,000 EUR. If you are interested, you can contact the WCH-coordinator Dr.Anne-Laure Tissier. Ulrike Beukert was one of the two winners of the 2017 Hans H. Ruthenberg Graduate Award. On September 20, 2017 she received the award for her successful master’s thesis “Genome-based Identification of Heterotic Patterns in Rice”, which she wrote at the Leibniz Institute for Plant Genetics and Crop Plant Research (IPK) in Gatersleben at the end of her studies in crop science at Martin Luther University Halle-Wittenberg (MLU). The prize is endowed with a total of 7,500 euros. As part of her master’s thesis, Ulrike Beukert identified optimal parental line combinations for the development of hybrid rice seed based on the sophisticated biostatistical analysis of yield and gene marker data. In doing so she has made an important contribution to the increase in the resource-efficient production of one of the world’s most important staple foods. With the conferral of the Hans H. Ruthenberg Graduate Award, Ulrike Beukert’s outstanding achievements have been honored for the second time. Due to her excellent grades, she received a scholarship during her studies from Bayer CropScience AG, IPK and MLU at the initiative of the ScienceCampus Halle. “The distinction of the master’s thesis shows that the targeted support of young researchers motivates excellent students to contribute their scientific abilities to tackling global challenges such as food security,” says Prof. Jochen Reif, Head of the Breeding Research Division at IPK. 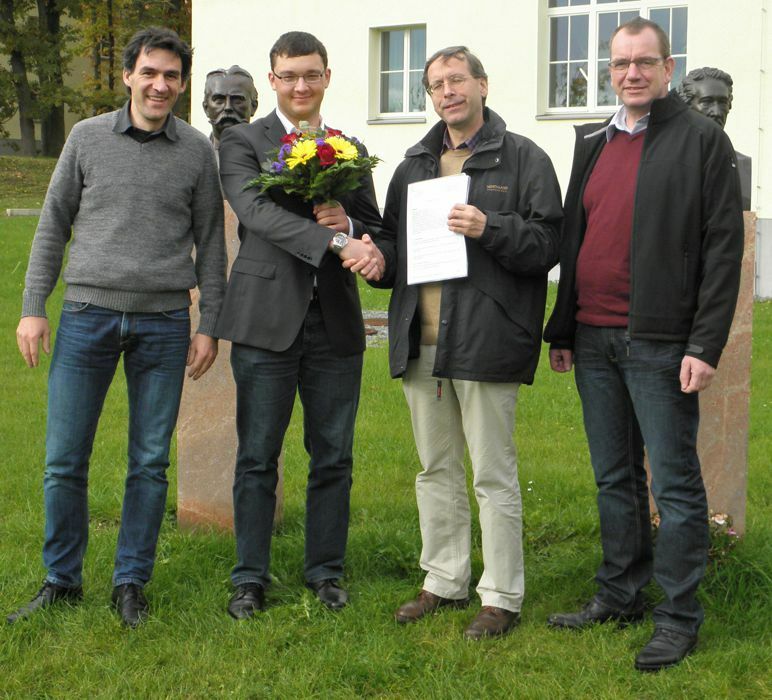 Jochen Reif, also a recipient of the Hans H. Ruthenberg Graduate Award, scientifically supervised the master’s thesis alongside Prof. Klaus Pillen, spokesperson for the ScienceCampus Halle and professor of plant breeding at MLU. Ulrike Beukert will continue her scientific career at the Julius Kühn Institute in Quedlinburg in the field of resistance research and stress tolerance. The ScienceCampus Halle - Plant-Based Bioeconomy (WCH) scholarship supports highly talented students in the field of bioeconomy. In 2017, the WCH-scholarship will support a research internship in the field of new, high-value plant products in UFZ (Helmholtz-Centre for Environmental Research) in Leipzig. The WCH-scholarship funds are €735 per month for a maximum period of six months. the WCH-scholarship is awarded irrespective of income and of nationality. previous excellent academic results at university. a certificate of enrolment at a university in Saxony-Anhalt for 2017. See http://www.sciencecampus-halle.de for further information about the ScienceCampus Halle - Plant-Based Bioeconomy. See https://www.ufz.de/index.php?en=34276 for further information about the internships in UFZ. For any queries contact Dr. Anne-Laure Tissier, WCH scientific coordinator; E-mail: anne-laure.tissier@sciencecampus-halle.de. Please submit your full application dossier in a single PDF file until 15.01.2017 to: anne-laure.tissier@sciencecampus-halle.de. The natural science and economic research network ScienceCampus Halle - Plant-Based Bioeconomy (WCH) promotes from 1st November 2015 the student Christin Mannewitz of the Burg Giebichenstein University of Art and Design Halle. The student in textile design examines the potential of plant (waste) for the development of new materials and had already produced in first attempts compostable bags from agricultural waste. For six months she will receive for the realization of her Master's thesis monthly the BAföG maximum rate. 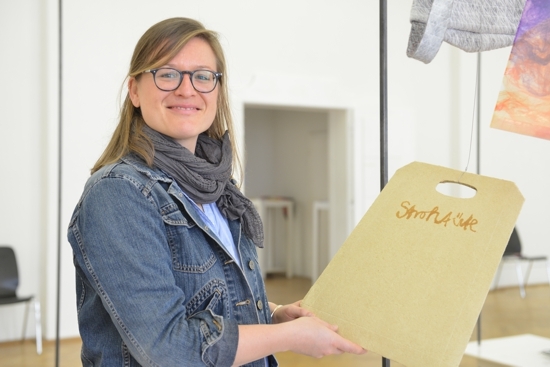 With her bachelor thesis Christin Mannewitz had developed an own material which has enough strength to make bags or similar products. She is using the technique of papermaking from different plant waste such as straw or rhubarb and asparagus peelings. Based on these results the experiments for papermaking are now being further developed. The analysis of the experimental use of the material in terms of aesthetics, stability and processing is paramount. According to a circular economy, more detailed experiments are carried out in terms of durability and coatings. The theoretical analysis of the work deals with bioeconomy, its necessity and criticism. Against the backdrop of increasingly scarce resources, it is among other things necessary, to improve the extensive utilization of all parts of plants to provide plant-based, healthy food and products for the world's population. One of the aims of the WCH, a association of experts in the field of plant, agricultural, economic and social sciences and biotechnology sponsored by Saxony-Anhalt and the Leibniz Association, is to strengthen the teaching in this area and to work transdisciplinary. At the initiative of the WCH three industrial scholarships for Master Students of Crop Sciences of the Martin-Luther-University Halle-Wittenberg have been raised. The grant for the project of the Burg-student is the first scholarship specially awarded by the WCH. The Martin-Luther-University Halle-Wittenberg (MLU) and the Syngenta Seeds GmbH have issued a scholarship to support students of the master program Crop Plant Sciences. As the first scholar Norman Philipp is pleased about the financial support for his two-year master program. Philipp has distinguished himself during his undergraduate studies of Agricultural Sciences at the MLU by outstanding achievements in the field of plant breeding. He was selected, after a nomination by the Chair of Plant Breeding, Prof. Dr. Klaus Pillen, and an application process by Syngenta. The scholarship is equivalent to the maximum rate of the German Federal Law on Support in Education (BAföG). It also includes a two-month internship as well as a master thesis in collaboration with Syngenta. Based in Bad Salzuflen Syngenta Seeds is one of the world's leading plant breeding companies. Pillen, is the speaker of the ScienceCampus Halle – Plant Based BioEconomy (WCH) and has set himself the goal to strengthen the teaching and training of students in the field of plant-based bioeconomy. With the aid of this financial incentive he wants to arouse the interest of students for the concerns of the bioeconomy. Numerous companies in the field of plant breeding are based in Saxony-Anhalt. Therefore a great demand for young and competent scientists in the fields of plant breeding and bioeconomy is given. It is planned to arrange the sponsorship on a long-term base and to issue the scholarship with Syngenta regularly. In addition, the current scholarship may be exemplary for further research and teaching cooperations of the MLU with the bioeconomy industry in Saxony-Anhalt.